Dylan just loves, what we call "once upon a time" stories, in which we tell him a tale from our childhoods! He never tires of hearing them, and often asks for his favourites, even when we've forgotten which ones he is asking for! Just recently I was telling him about the time my father went on a sailing trip for two weeks, when I was about 6 or 7. I told him that I was very sad my dad had gone on holiday, becuase two weeks is a very long time for a sad girl who misses her daddy. But then I went on to the part, were my dad promised (on the telephone) to bring me a special gift when he returned! Boy was I excited! So a few days later when he returned he brought me my "Special Ted". My teddy was just beautiful and I loved him for many years! Even now he sits on our bed during the day...as it really would just look odd without him! And so I brought "Special Ted" out when I had finished telling my story...Dylan was so excited that "Special Ted" was still alive! ;) We disussed how you could tell, I had loved him very much over the years, by the way his fur had been rubbed off in places, half his smile has gone, the tear in his ear and how many chips were on his little nose! Our talk reminded me of "The Velveteen Rabbit", which is one of my favourite children's books. Then just this Friday, we picked this book out of the library...about the very same thing! 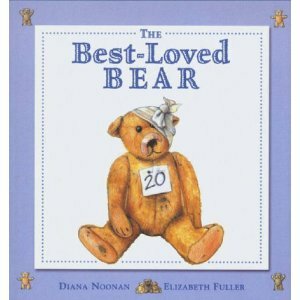 The Best Loved Bear! It was such a simple but sweet story for young readers, that I wanted to share it with you all! The Imaginings Of A 3 Year Old!